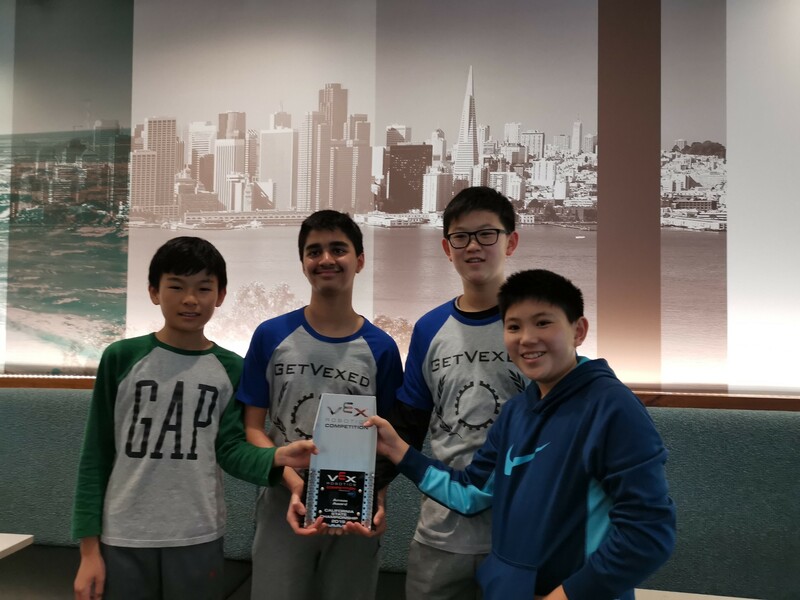 On March 3, team GetVexed, made up of Harker seventh graders Joe Li, Jordan Labio, Nathan T. Liu, Ramit Goyal and Sriram Bhimaraju placed second in the Robot Skills category in the California VEX Robotics Middle School State Championship in San Jose. Their Robot Skills score is the 10th highest in US (15th in the world) since the VEX Turning Point season began in July of 2018, and qualifies them to attend the VEX World Championships, to be held April 24-27 in Louisville, Ky. Only three percent of all middle school teams qualify for the VEX World Championships. GetVexed credited team Paradigm – composed of eighth graders graders Nidhya Shivakumar and Amrita Pasupathy – and their coach for helping them in their first season. In addition, GetVexed also won the Amaze Award, which is given to the team with a consistently top-performing robot. Earlier in the season, the team won a Judges Award at the Gael Force Battle of the Bay High School tournament, and placed second at a tournament at Sacred Heart Middle School.